A problem ? A comment about this site ? Our weekly report is usually available on wednesday morning. 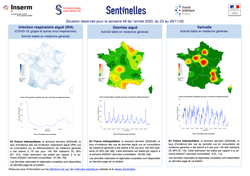 You will find information about seasonal epidemic situation and forecasts. You can subscribe to our mailing list by filling the form below. You will receive the english version of our weekly report each week on wednesday morning.